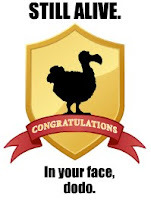 If you are a member of 20-Something Bloggers, vote now for the 20SB Bootleg Awards. You have until Jan. 19 to cast your vote... but why wait? Do it now! Seriously, how can you resist that? What kind of monster are you? Okay, do I get the cat or do I just get to look at the pic. Honestly, I would settle for the hat. No cat needed. I voted! I voted! The adorable picture was unnecessary for my vote but I still love it! So...you're going to give me that cat? Ben, you've taught me a priceless lesson. Bloggers are literal and cutthroat. No cat. Sorry. Do we at least get the cute frog hat for the cat so I can force my cat (with love) to wear it? 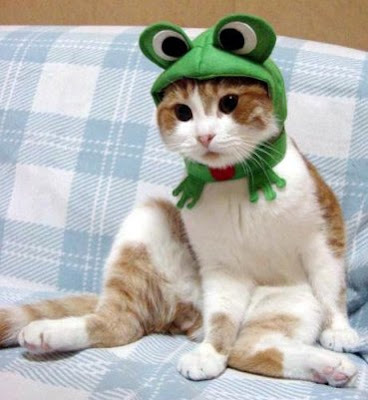 omg, i want to make my cat wear the froggy hat. she'd hate me for life, but it would be so worth it. Listen everyone, I'm pretty sure that company that made those frog hats went out of business. It was a Japanese company that made a variety of headwear for cats in the early 2000's. I didn't know you would all react so strongly to the frog cat... but now that I know the power it has over you all... I kind of feel like I hold the key to universe. Bwahaha! I want the cat's hat at the very least. Dammit! I should have read your response last night...my vote may have been different. I lie. But after not being gifted with the frog cat I feel I can be a little petty. 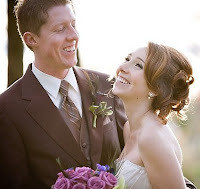 Already voted for you, no bride necessary, but that was super cute! Voted! :) Good luck!!! And that cat is awesome btw. Already voted for you of course! I'm not much of a cat person, so that isn't too tempting. A puppy however...oh i'd do anything for a puppy. Lauren, I think Jetta would wear a frog hat well. ..and this is why you're nominated for most interesting. Who else bribes people with cats dressed up in costumes? Very appropriate. No need for a bribe though, I already voted for you. That is VERY hard to resist for a cat lover like myself. YIKES! I think the monster isn't someone who resists this bribe, but is someone who actually puts this on their poor cat!